Is your SEO outsource provider giving you everything you need to retain clients? As internet marketing tools evolve, our company, seoreseller.com has added new features on the back end that give you the competitive edge. You can now check your clients daily ranking progress right from our easy to use dashboard. Now you have the power to monitor real time campaign growth. The dashboard enables resellers to constantly monitor the progress of all their client campaigns. Each campaign’s rankings can be viewed in detail by the keyword they are trying to rank for. A reseller can monitor the changes of his/her client’s rank in a particular search engine in real time. 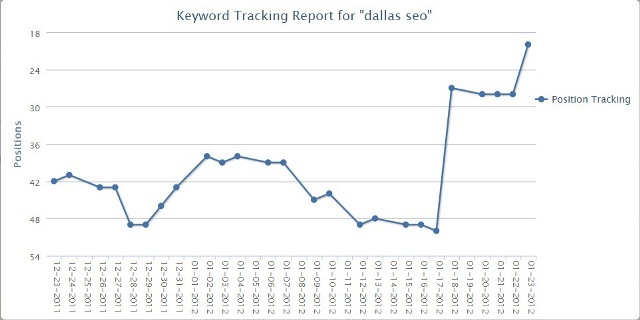 As an example the picture shows a campaign trying to rank for 10 keywords (in blue). Notice that each keyword’s position and rank changes can be monitored. Upon clicking on the keyword, a graph depicting historical changes in position is displayed. Whenever clients ask for updates, you can easily answer them by checking their organic ranking growth in our back end. Showing the power of SEO is now easier than ever so you can attract more clients. If you don’t have an account, get on today and see how easy it is to profit from a multi-billion dollar industry.